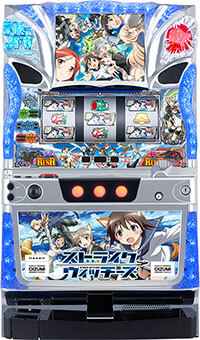 Today, we will be introducing a pachislot machine of “Strike Witches”, which have been adapted into variety of contents such as manga, animation and games. Specifications and rendition aspects of the machine has not been revealed yet, but we are certain that it is completed in a way that fans of pachislot and original work can agree upon. You should focus on how the high-speed aerial battle in the original work is expressed in the pachislot machine. It will be released around this summer from Oizumi!